Click the title of the publication to download a copy. 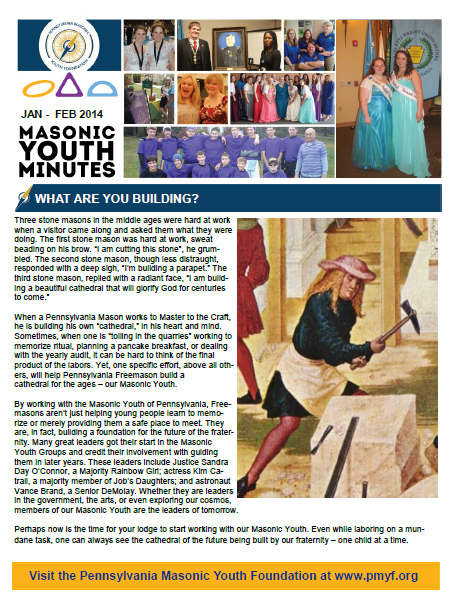 The Masonic Youth Minutes – a bimonthly review of major happenings in the PA Masonic youth community. This newsletter is mailed to all Worshipful Masters, Lodge Secretaries, Youth Chairs, and other supporters of the PA Masonic Youth Program. The Youth Minutes provide material Lodges can use to give a one-minute report on youth at each stated meeting. For the latest issue, select from the QUICK PICKS menu to the right. How To Start a Masonic Youth Group – This is a general review of the process to start a Rainbow Assembly, a DeMolay Chapter or a Job’s Daughters Bethel. Each group has its own specific procedures and guidelines, but this outline will give you a basic overview of the commitment needed to be successful. What Have We Got To Offer? – A Blueprint for developing a successful Masonic Youth program in your Lodge. 101 Things Your Lodge Can Do For Masonic Youth – 101 practical suggestions for big and small ways you can do something positive for a local or state-wide youth program. Real World Rules – Simple rules to encourage personal responsibility and smart living. The Masonic Scholarship Resource Guide – see the Scholarships section of our site for details on this annual publication. Volunteer Position Descriptions – Are you a Lodge or District Youth Chairman? Get a printable “job description” here. *All PMYF print material posted on this site, except where otherwise noted, is copyrighted material. Permission is granted to make copies for free distribution. Written permission is required to reprint in any other publication.